NG3 Pompeii. Porta Nola Tombs. Tomb of Lucius Manilius Saturninus, son of Quartus. De Caro, 1979, Cronache Pompeiana V, pp. 179-187. Soprintendenza Archeologica di Pompei,1998. Pompei Oltre la Vita: Nuove testimonianze dalle necropoli. Exhibition catalogue, pp. 39-42. Tomb NG3 Pompeii. 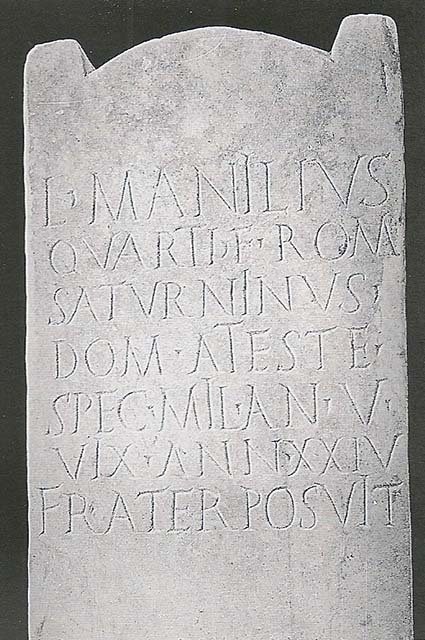 Tomb of Lucius Manilius Saturninus, son of Quartus. Lucius Manilius Saturninus, son of Quartus, of the Romilian tribe, Ateste his hometown, bodyguard, performed military service for 5 years, lived for 24 years. His brother set this up. See Cooley, A. and M.G.L., 2004. Pompeii : A Sourcebook. London : Routledge. G67, p.156.